Christopher Czarnecki’s commitment to fine dining was imprinted on him early, literally from the age of 9, when he was allowed to fill the water glasses at his parents’ restaurant – originally called Joe’s Restaurant and located in Reading, PA and now, The Joel Palmer House, a landmark in Oregon’s wine country. The world of his childhood was a world of fresh local ingredients, fine wines, busy kitchens, and grateful, happy diners – a world he knew he would inhabit as an adult. Czarnecki stepped out of that world for three years in 2003, when he joined the Army, working in food service, including a year of service in Iraq. During the time when Christopher was “cooking in combat boots” he learned the art of precision, and of course, following the rules. Christopher’s covert attempt at spicing up a dish with herbs and butter at one dinner only earned him 50 pushups, rather than the certain gratitude of his comrades. Chris regards his time in the dining hall as a learning opportunity, and was happy to return to a region where his creativity is fed and supported by the abundance of the area. 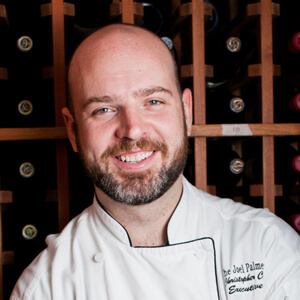 Beginning in 2006, Christopher made his way back to The Joel Palmer House kitchen, taking over the reins from his father, Jack Czarnecki, as chef in 2007. His parents retired in 2008. In 2014, Chris and his wife, Mary, opened their 2nd restaurant, “The Barlow Room” in Dayton. Designed from the ground up to complement The Joel Palmer House, this new venue is open for lunch, on Sundays, and for special events and catering. The historic bar, casual menu, family friendly atmosphere, craft beers and cocktails make this the go-to local hang out for locals and winery folks. Czarnecki revels in the bounty of the restaurants’ location in Dayton, in the heart of Oregon’s Pinot Noir country. Czarnecki continues the family tradition of cooking with wild mushrooms, building his menu around whatever local mushrooms his foragers bring to the back door of the kitchen, along with other seasonal specialties. Czarnecki and his wife, Mary, are building their own vegetable gardens in order to provide “hyper-local” produce to the restaurant as well as a mushroom cultivation patch on the property. On the wine side, the cellar at The Joel Palmer House reflects Czarnecki’s passion for the best local wines. With more than 500 Oregon Pinot noir wines on the list, and a Wine Spectator “Best of” Award of Excellence since 2010, Christopher often spends time in the cellar with a glass of Pinot noir reflecting on the life he’s built in The Joel Palmer House – the good life.